I finished with Traffic: Why We Drive the Way We Do (and What It Says About Us) by Tom Vanderbilt recently. The book details many different aspects of driving and how our reactions affect us and our driving. We all tend to think of driving as really, a pretty easy thing to do. Some (at least in the US) go so far as to think it a right as opposed to a privilege. However, think of it more like Vanderbilt does. “[Driving] is actually an incredibly complex and demanding task: We are navigating through a legal system, we are becoming social actors in a spontaneous setting, we are processing a bewildering amount of information, we are constantly making predictions and calculations and on-the-fly judgements of risk and reward, and we’re engaging in a huge amount of sensory and cognitive activity–the full scope of which scientists are just beginning to understand.” Not really so easy after all. (Go human brains!) In spite of all this, we’re not really good at multi-tasking, hence the problems people have when trying to eat, do their make up, adjust their stereos, mess around with their phones, etc. while driving. This book is about traffic with a heavy side of psychology thrown in. Many facts you might not believe, and many more you likely will and just haven’t thought about them yet. I even learned a bit about different cultures after reading about how various places drive. I found all of it quite fascinating. I know at the very least Traffic made me think more about the mistakes I make while driving and to pay more attention to what I’m doing. I have to admit though: no matter how much I realize I shouldn’t, I’ll still keep listening to my audiobooks. It’s what keeps me awake (particularly on long trips), so that’s important too! 😉 And, because of the epilogue, now I want to take a driving course. I’m curious to know if I’m any good at driving, or if I’m like everyone else and just think I’m pretty good at it. I’m no race driver, don’t get me wrong, I’m just wondering about the daily stuff. I recommend reading this novel if you’re interested in psychology or traffic at all. From the reviews I read, some folks didn’t get what they wanted to out of this book, but I’d say, based on the title and subtitle, it was exactly what I expected. I do have to note, in case anyone follows this recommendation: the last 1/4 of the book is acknowledgements, notes, and index so don’t be surprised like I was! I also just realized that the notes are listed by page number, which means that the text of the book is cleaner, but I didn’t even know the notes were there till I got to the epilogue (and wondered what the last 116 pages were for), so I never looked any of those up (nor would I really have known when to look). Still, I suspect many people won’t be reading the book for the notes, so it’s likely this was the best way to go when publishing. In any case, enjoy! And if you’re interested in more info check out the How We Drive blog. “Vici” is my idea of the backstory of how dragons were first domesticated by humans in Europe, and shows the seeds of various aspects of the relationship between dragons and humans that we see initially in Britain and other European nations in His Majesty’s Dragon. The novella brought me back to the complete enjoyment I first felt reading His Majesty’s Dragon. After the newness of the first Temeraire novel wore off I haven’t enjoyed the other novels as much, but I’m still fascinated by the idea and still buy the novels as they come out. I’m particularly thrilled by the series’ idea of a crossover between traditional dragons and friendly dragons (my introduction to dragons was from Anne McCaffrey, so I’m partial to the friendly ones)! 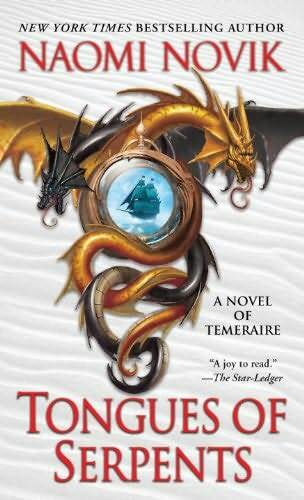 I have unfortunately not yet read Tongues of Serpents (though it is on my shelf), but I think I will very soon as her next Temeraire novel, Crucible of Gold, comes out tomorrow (read an excerpt here). Maybe they’ll be my next set of novels to read as I’ll be able to tackle a book from my shelf as well as a new one (so as to not get behind for once). In short, if you haven’t yet read the Temeraire novels and want a short piece to see what it’s all about, try “Vici”! 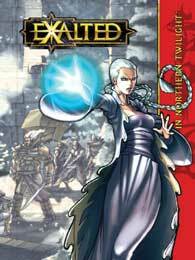 Most recently I finished a series of novels based on the White Wolf role playing game, Exalted. Exalted itself is well described on the page linked previously, but in short: the gods had previously exalted humans to do their work on earth, but over time this power corrupted the Unconquered Sun’s Solar Exalts and so the lowliest Exalted caste, the Dragon-Blooded, took it upon themselves to bring the Solars down. A thousand years pass and the Dragon-Bloods have gotten distracted from their mission thus allowing the reincarnating Solar Exalts to begin to return to the land. The initial intent of the RPG seemed to be to have the players form a circle (one of each of the 5 castes) of Solar Exalted with which to take on the major problems of the world. But the RPG included details on more than just the Solar Exalted so that players could be one of many different types of Exalt. 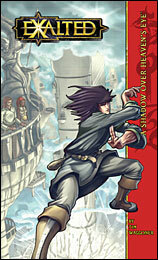 The style of the game included Crouching Tiger, Hidden Dragon style martial arts with Exalted who were so much more powerful than the regular humans in the world. I had hoped this series of novels would be an introduction to the creation of a circle of Solar Exalts with an overarching storyline, but they were more or less a bunch of unconnected stories of a few Solars’ minor exploits. That’s not to say they weren’t entertaining and didn’t really make me want to play, however! The first novel, A Day Dark as Night by Carl Bowen, was about Night Caste Harmonious Jade. She travels to Nexus to get revenge on a former mentor who betrayed her, and in the process meets several other Exalted, including Dawn Caste Dace. They help to put a stop to a Yozi plot to take over the city. This one was my least favorite of the set. 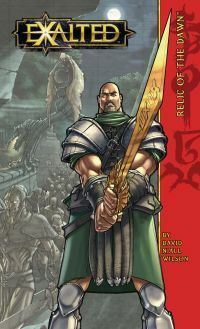 Relic of the Dawn, by David Niall Wilson, tells of Dace and his mercenary company’s exploits in a allied city against an Abyssal (the Underworld’s counterpoint to Solars) and his undead army. Dace’s story also includes him working together with a Lunar Exalt and them both trying to find out about their past. 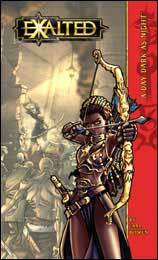 I like Dace as a character, but for whatever reason, this novel was also not one of my favorites of the series. In Northern Twilight by Jess Hartley is about Twilight Caste Arianna and Eclipse Caste Swan. Interestingly, this is the first of the novels to describe each character’s Exaltation. They travel together almost haphazardly until events bring them together to help save a forest lord from the destruction of his forest caused by a battle instigated by their traveling companions. 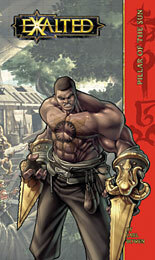 Panther, a Zenith Caste Solar, is the focus of the fourth novel, Pillar of the Sun by Carl Bowen. Formerly a pit fighter, Panther, earned his way to freedom until he was Exalted after realizing he didn’t really have anything to live for. He treks across half the world to find a mission for himself fighting some Wyld mutated barbarians lead by a Lunar. Swan returns in A Shadow over Heaven’s Eye by Tim Waggoner. He travels to a city he had helped before as diplomat. While there he discovers that the daughter of his royal family friend seems to be ready to Exalt herself. 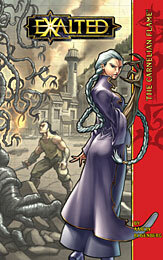 However, she turns out to be a Sidereal Exalt with powers of predicting and affecting the future. Together they stop another Sidereal’s plans to take over the world. As cheesy as my summary sounds, and in spite of the fact that I hate the idea of destiny, which is a thread that runs strongly through the story, this novel was one of my favorites. And last, but not least, was The Carnelian Flame by Aaron Rosenburg. This novel was my other favorite. Arianna returns this time to help Grendis Lam, a newly exalted Zenith, destroy the Abyssal he helped to put on the throne of Ortense. Their mix of brains and brawn form a true picture of how the complementary aptitudes of the various castes are supposed to work together. 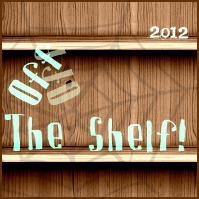 And now for this year’s Off the Shelf Challenge. I was originally going to go with the same level as I did last year with the “Trying” at reading 15 books off the shelf (which I didn’t even make last year) but I think this year I’ll try the “Making a Dint” option of 30 books off the shelf. That may be stretching it, but hey, I’ve already read four, so I’m feeling optimistic! Just as a side note, I’ve got many books on my Kindle (all of them actually) that would technically qualify for this challenge, and even a few audiobooks, but I tend to not keep track of when I bought those. So, primarily, unless I go on vacation and happen to read something on my Kindle, these will all be physical books that I’ve finally gotten the chance to move from my TBR bookcase to their real spot in my collection. The people have voted, and a random, atypical for me book won the next up type of reading poll by a landslide with a whopping 4 votes! 😉 So, the following are the options I’d like for you to choose from this time. Instead of going for a poll, I’d appreciate it if you’d just leave a comment as to your preference this time. It’d be especially great if you’d tell me why you chose what you did! I think I’ll also read a random small book from this set as well, just to give me more time to prep for the next what to read poll, and of course, to help aid in cleaning off my to be read shelves! We’ve all heard of this one, most likely you’ve read it. I had to read this in high school, I think it was, and I distinctly remember enjoying it at the time, but beyond that? I’ve basically got nothing. Hence the desire to reread it! Ok, so this one’s a little cheating, as mysteries have generally made it onto a typical for me reading list. But as it’s the only one I think I had on my shelf that wasn’t strictly sci fi or fantasy, it ended up here. It’d be the fun choice of all these, most likely. This one’s an ARC I randomly picked up at a bookstore back when I was in college. Besides that and the blurb, I don’t know much about it, but I will read it eventually! This book is one I decided to put on my wishlist after looking for books on traffic in downtowns. So, while it’s kind of a work-related book, the description of what all is reasearched here actually sounds pretty fascinating to me. Eye-opening and mind-expanding, “Mapping Our Genes” tells of the experts who are brightly hopeful about using genetic mapping and engineering as weapons in the war against the many incurable genetically inherited maladies. Well, I didn’t quite make it, but 2 out of 3 isn’t bad! And my reviewing capabilities were even worse, so there’s something. 😉 Here’s to hoping I make it farther this year! I started the year (or technically ended last year) by starting a series of 6 books off my shelf (which I will hopefully review all at once when I’m finished). 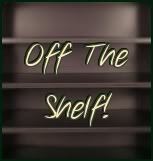 And while I’m still reading those, but before I move on, I’m looking to you for help deciding what I should read next. I’m going to break this down into two parts, since it’ll still be a little while till I finish these last 2.5 books. The first part, what type of story should I read next? That is, should it be a collection of short stories? Should I read the most recent novel(s) of a series? Should I read all of a series I have the books for, but that aren’t associated with something I’m already reading? Should I start a completely new series and broaden my horizons a bit? Should it be a stand alone novel, or something that’s generally completely outside my normal genre preferences? I plan to choose 5 options in the chosen category once this poll’s complete. Let’s go till January 30, first thing in the morning to choose this part of the process.